I recently attended my first UNconference this summer and it was UNbelievable! The second day of the Google Teacher Academy in Chicago featured an "unconference" day which allowed for all of the Google Certified Teachers to participate in creating the workshop sessions that were going to be offered for that day. This was such an empowering and differentiated professional learning experience like none other. After attending the Google Teacher Academy, I began researching more about "unconferences" because I was so interested and wanted to learn more about them. This blog post is dedicated to unpacking what I have learned about the "unconference". 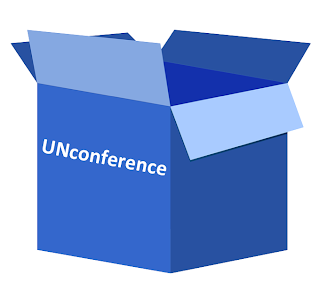 To help simplify this concept a bit, let's look at the definition provided by the Google Search "define: unconference"
Now that we know what an "unconference" is (by definition) let's begin to add some context and relevance. The "unconference" approach to professional development is sweeping the nation and is becoming increasingly popular, especially among innovative educators. Unconferences are popping up all over the place, probably at a city near you! The best part is that anyone can attend, for free! 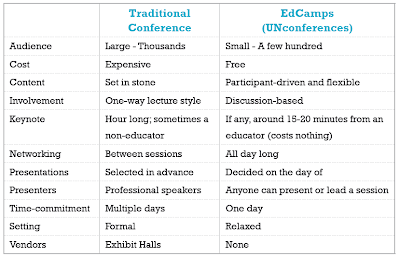 One of the most popular "unconference" events are called EdCamps. Let's take a closer look at what an EdCamp is. 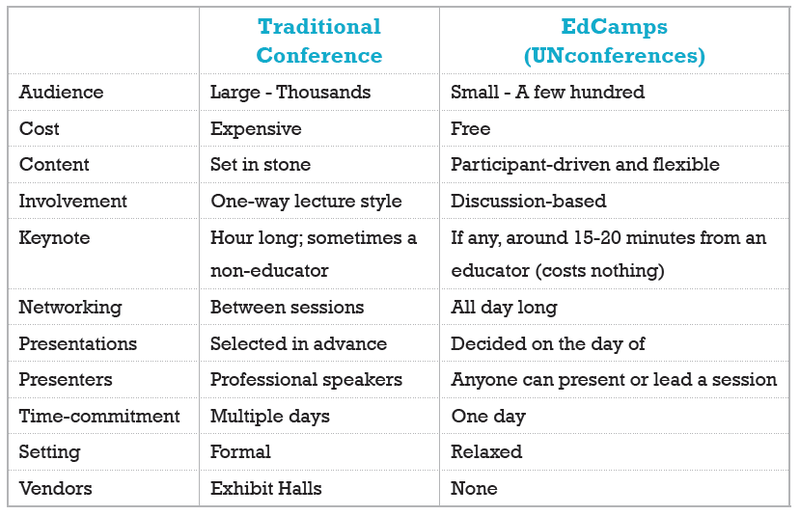 Below is a great graphic organizer that compares and contrasts an EdCamp's "Unconference" to a traditional conference. Most "unconferences" collect data and information on what the participants are interested in learning about in many different ways. At the Google Teacher Academy, we used some amazing Google Apps and tools to help us collect this information so that we could spontaneously create our differentiated workshop sessions. We first started by creating a Google Form which asked the participants to recommend a topic for a workshop session. The topics could range from ideas and learning tools that the participants wanted to learn more about, to ideas and learning tools that the participants felt comfortable leading and teaching. After the responses were collected from the Google Form, Google Scripts were used to create another Google Form that compiled, analyzed and distributed the topics into a multiple choice format for the participants (based on the most popular topics that were submitted). Some of the Google Scripts that were used included Doctopus, AutoCrat, and FormMule. Once this new Google Form was created, the participants then chose their top three topics to explore (or lead) during the workshops. The coolest thing about it, was that this process only took about 10-15 minutes from start to finish. Because of this "unconference" opportunity, and the use of Google Apps, I was able to attend three different workshops to learn more about the topics that interested me. This was such a powerful and empowering learning experience that I will never forget. Now that I have single-handedly experienced an "unconference" I am going to try to implement this style of professional development in my own school district, and at other traditional conferences, workshops and events, and I encourage you do to the same. A great way to begin this process is to follow the Twitter Hashtag #EdCamp and #unconference. There will be plenty of conversations around these events, including resources and ideas that will be shared regarding "unconferences". I also recommend checking out the EdCamp website to learn more information about these events. As powerful as "unconferences" can be, they are only as powerful as the people who attend them. So, learn more about them, and share your findings, experiences, and innovative ideas with your Personal Learning Network (PLN). Who knows, I just might be seeing you at one soon!